Best Outdoor Kitchen Cabinets for Your Outdoor Kitchen. 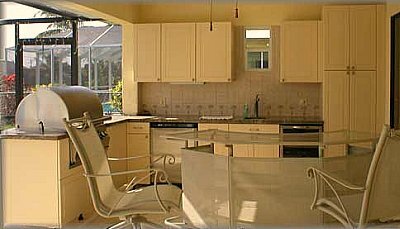 Outdoor kitchen cabinets are the basic "building blocks" of your outdoor kitchen. The countertops, the appliances, all the really cool stuff - that all comes after the cabinets. But don't think of the cabinets as just something to hold up the grill and the countertops. The cabinets are often the focal point of the entire kitchen. As is the case with all of the other components - they have to fit with the other pieces. In the case of outdoor kitchen cabinets, that means aesthetically and literally. You will have to make appliance selections before ordering your outdoor kitchen cabinets since they various components will have to fit into the cabinetry. 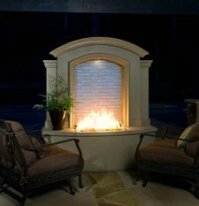 Outdoor kitchen cabinets are available in a variety of materials. The teak cabinetry above would be a stunning addition to any outdoor kitchen. But every style has its pros and cons. Let's take a look at those. Teak - this wood is prized for boat building, so it clearly can handle the wet weather. Cypress - cypress trees grow in swampy areas and in lakes, so again, water is not a problem. Bamboo - Bamboo contains natural resins that repel water, so it also makes a practical and beautiful choice. All of these woods have natural and inherent properties that make them resistent to water and the harm it does to most other woods. But that property diminishes once the tree is cut down, so you will have to help. Teak oil (or a substitute) needs to be periodically applied to these woods in order to keep them protected. Depending on the extremes they are subjected to, that maintenance schedule may vary greatly. 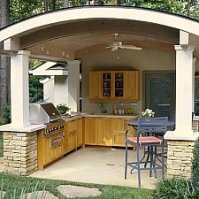 These outdoor kitchen cabinets would be better suited to an area protected from the worst of the rain and sun, such as under a gazebo or a covered porch. In most cases, even with proper care, these cabinets will begin to show the effects of weather exposure and will eventually deteriorate. They are also expensive. Individual components can start around $5000 and go up, so if you need several pieces, the number can get high in a hurry. 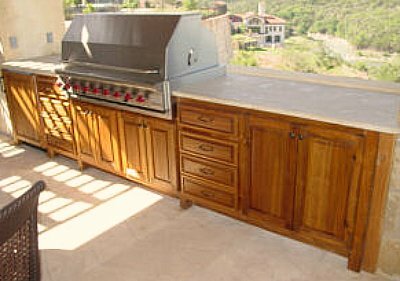 You may find options for building outdoor kitchen cabinets from exterior grade plywood and then painting or staining them. If your budget is very tight and you insist on wood, this may be the only way to get what you want. But keep in mind there will be frequent maintenance and you will still quickly lose the battle to the elements. There are likely to be better options for you discussed below. 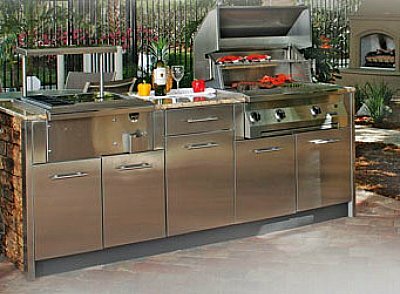 Stainless steel offers another attractive option for outdoor kitchen cabinets. There is certainly none of the worry about swelling and shrinkage related to moisture and humidity. Stainless steel won't rust, so there is virtually no worry about the elements. 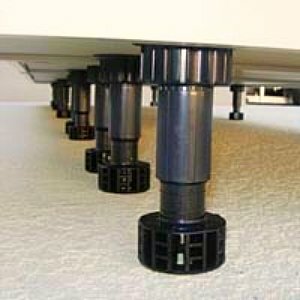 Most stainless steel cabinets come with adjustable legs for easy leveling, as well as with rustproof (stainless steel) hinges. A toe kick panel usually snaps to the legs, hiding them and giving a finished appearance. These options are common and recommended in all outdoor cabinets, regardless of the material used. As usual, there is a trade off - stainless steel is notoriously hard to keep clean. Even inside, this can be a challenge. Outside is even more of a challenge. Why do you think they make all those stainless steel cleaners? Some folks think stainless steel cabinets look a bit too industrial and sterile. When you add in the stainless steel appliances and sink, they may have a point. 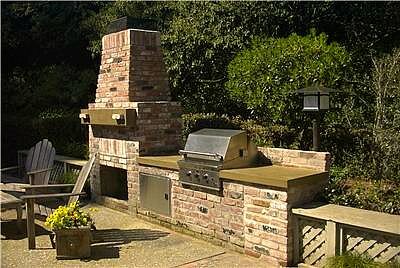 Brick and / or stone are excellent choices for outdoor kitchen cabinets. Okay, technically, they really aren't cabinets - rather they are "platforms" for holding the appliances and other related things. But for our purposes they qualify as cabinetry. They are impervious to the elements - that's what they are designed for. They look great and come in an infinite variety of colors, styles and combinations. They have an inherent outdoorsy look and feel. The price point is usually somewhere in the middle of the other options. Maintenance is essentially non-existent. Another big advantage of these materials is that they won't dent or scratch (unlike wood or stainless steel). So unless your outdoor guests walk around elegantly with a pinky extended saying "hip hip" all the time, think about how durable your choice of materials is. Will there be kids with toys around? Will there be grown "kids" with impromptu frisbees closely resembling your trash can lid around? What are the negatives associated with masonry cabinets? Well, depending on your application - they may be huge. Brick, block, and stone are heavy. When you put a lot of them together, they can be very heavy. So if you need is for a kitchen on an elevated deck, you may have a problem. Decks can be reinforced, so it may not be an insurmountable problem, but be aware of it. Frankly, wood and stainless steel cabinets can add significant weight as well. It's always a good idea to get a load calculation done to see what modifications may be necessary. That sounds complicated, but it really isn't. Its basically a function of joist size (2X8, 2X10, etc), joist spacing (12", 16", or 24" on center)and joist span(the distance between where the joist is supported). With that information, your local lumber yard can probably help you. The ideal place for a masonry style kitchen is on the ground, typically with a patio. 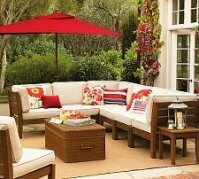 The patio itself should be a suitable footing, but if you don't want to take up your patio space, the footing is easy to add beside the patio. What? Plastic outdoor kitchen cabinets? Okay, try this - tilt your nose up slightly and say "Marine Grade Polymer" with a slight British accent. Feel better? Good. First - not all plastic cabinets are marine grade polymer. Just like wood, all plastics are not equal. But the better plastic cabinets are quite nice. They are available in numerous colors, or they can be stained or painted to look similar to wood - but allow me to qualify that. I love wood and the richness of the grain patterns. You will not get plastic - oops, I mean marine grade polymer- to look exactly like wood. You can't get that depth, that warmness. But you can get a nice looking finish that will be perfectly acceptable for most people. (except maybe the ones with their pinkies out saying "hip hip") They are relatively lightweight so you may be able to use them on an existing deck. (still - check that load calculation) These cabinets will not warp, will not rot, will not deteriorate. Unless you stain or paint them, there is virtually no maintenance. Overall, not a bad choice. So check your budget, weigh the options, and filter in your tastes. Pick a cabinet style and get things rolling!